This unique DVD Secrets in the Stones explores the question of who really created the great civilistions of the world. 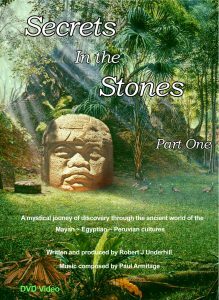 A unique DVD that poses the question “Who really created the great civilizations of the world and who were our real ancestors?” What made it possible for ancient cultures such as the Inca, the Maya and the Egyptians to suddenly appear on the timeline of history already endowed with very advanced skills and cosmic knowledge? These questions are not adequately answered by conventional archaeology, but this film attempts to look through the eyes of the ‘ancestors’, revealing evidence that challenges the mainstream historical view. Secrets in the Stones explore the probability that the architects of our ancient world were really cosmic colonizers! Stunning scenes are enriched with the beautiful music of international composer Paul Armitage – his unique soundscape invites you to enter your own inner spiritual journey of discovery travelling through the mysterious world of the Maya, Egyptian and Peruvian cultures. The DVD features a wealth of temple artwork including some of the exceptional work of classical artist Diana May Nobbs, who lived amongst the ancient Mayan temple sites for many years. Diana's artwork encapsulates the very timeless essence of these enigmatic sacred sites. Please note: - Part one is currently sold out - however a new production run will be coming . Miles Johnston - Investigative Film Producer. Former BBC - Sky Television and Irish Radio Engineer. Robert Gendler - Astrophotographer and author of ‘A Year in the Life of the Universe’. Sandy Stevenson: Australian author of the bestselling books ‘The Awakener’ & ‘I Am Here’, and international workshop presenter. Aluna Joy Yaxkin: International author, spiritual life coach and renowned sacred site guide. Copyright 2009 - 2019 Robert J Underhill All rights reserved.